Gazing at the magnificent 8m meter-high statue of Lord Muruga at the corner of Northcroft Drive and Esselen Crescent in Northcroft, Phoenix – artisans and devotees of the Stri Muruga Kovil still cannot believe that months of hard sweat and toil have come to fruition. 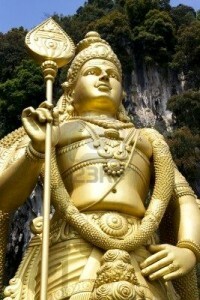 Ahead of Vaigasi Visagam (the appearance day of Lord Muruga) on the 13th of June, the Stri Muruga Kovil will be unveiling a most beautiful gold Lord Muruga statue at the temple site, 2 Esselen Crescent, Northcroft, Phoenix on Sunday, 12 June 2011 at 11am. Built as part of the temple’s “150 Year” initiatives, the completion of the statue was made possible through the hard work and dedication of sponsors, well-wishers and artisans from India as well devotees who underwent numerous fundraising drives and spread the word to friends and family. Lord Muruga, also known as Subramanya, Skanda and Kartikkeya, among others, is regarded as a protector of culture and language. Worship to Lord Muruga is done by all sects who turn up in their numbers during annual Thai Poosam, Pangani Uthirum and Chitra Paruvam Kavady festivals. It’s important to make a contribution in memory of the legacy of our forefathers who brought the teachings of Hindu Dharma with them 150 years ago. Let’s use this opportunity to come in our numbers to the unveiling and thus intensify our love and devotion to the Lord. The day’s festivities are made possible by partners First National Bank, B. Nagiah’s, Rising Sun, DSTV Indian, Saffron TV, Lotus FM, Ram Holdings and Jet Airways. Spectators can look forward to a wonderful day of spiritual and cultural entertainment on the FNB stage and the opportunity to offer flowers to Lord Muruga. 2 tickets to India courtesy of Jet Airways are also up for grabs together with decoder prizes & giveaways by DSTV Indian. There will also be exclusive coverage by Rising Sun & Saffron TV with lunch sponsored by B. Nagiah’s. The day culminates with a live broadcast of Lotus FM’s devotional programme Bhakthi Sangeeth and a fireworks display.